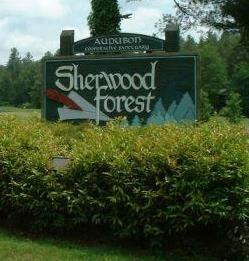 Sherwood Forest is a residential community and includes 200 homes and condominiums, resting on one thousand forested acres in southern Transylvania County, North Carolina. As an Audubon Cooperative Sanctuary, residents place a high priority on maintaining the natural environment and preserving native species of both plants and animals. Home Owners in Sherwood Forest, strive to live in harmony with our natural surroundings by maintaining a sustainable balance between nature and the human presence. As such, lots in Sherwood Forest are left wooded and homes are designed to blend into the forest with minimal intrusion on the environment. Our population is diverse including retired individuals, as well as those still in the work force; individuals in their 80's, as well as families with children; part-time residents, as well as those who live here full time. Sherwood Forest also offers a 18 hole Golf Course open to the public year-round and welcomes golfers of all ages located in an Audubon Sanctuary Development protected by the beautiful mountains of Western North Carolina. The course is fun and challenging for golfers of all ages and skill levels and only 9 miles south of Brevard, North Carolina. The course has received the first stage of certification from the Audubon Sanctuary Golf Course Certification Program. The first nine holes run along the Little River valley and the back nine meanders through scenic woods. The course is one of the finest executive courses on the east coast. It is sure to challenge golfers of all skill levels. The golf course also offers a fully stocked pro shop, custom club repair shop and a club room with snack bar. Improve your game with Brian Lautenschlager, PGA Professional, who offers instruction in both a private and class setting. League play is available for both men and women. In addition to golfing, the surrounding area offers many opportunities for outdoor recreation.